Filled to the brim with proprietary creamy wax, the Floraison 4 oz. Candlepot is the smaller version of the large Candlepot packaged into a cute colorful box. The creamy wax is combined with handmade perfume fragrance in a soft silky frosted glass; each candle will easily scent a medium to large room with a 35 hour burn time. 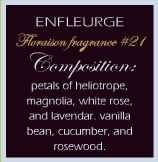 Enfleurage blends petals of Heliotrope, Magnolia, White Rose, Lavender, Vanilla Bean, Cucumber and Rosewood.